I've been looking for a way of organizing and storing my sermons for a while and, after experimenting with a bunch of different options, I decided to use Together, from Reinvented Software. It's only available for Macs so, if you have a PC, I suppose there's no point in you reading on but, if you have a Mac and are interested in seeing how I use Together to organize my sermons, read on! To give you an idea of how I use Together and what it's features are I'm going to start by walking you through adding a sermon. (If it gets too detailed for you, you might want to skip down to WHAT'S THE POINT?.) I'm guessing that I'm going to over explain some things and under explain others. Feel free to ask questions if you have them. 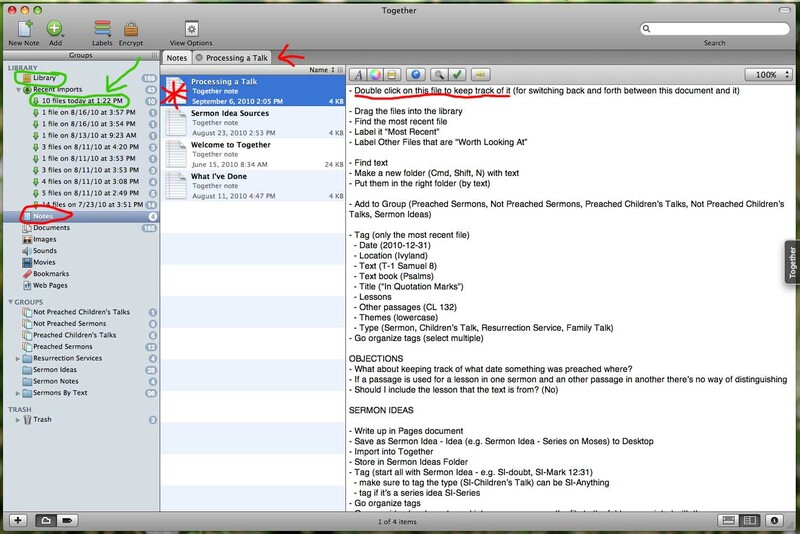 I'm sure there are lots of other ways that Together could be used to organize sermons. Let me know if you decide to use it in some other way or if you use some other system for organizing your sermons and feel like describing it. 1. Open Note: Open my "Processing a Talk" note to remind what I do to process a talk. 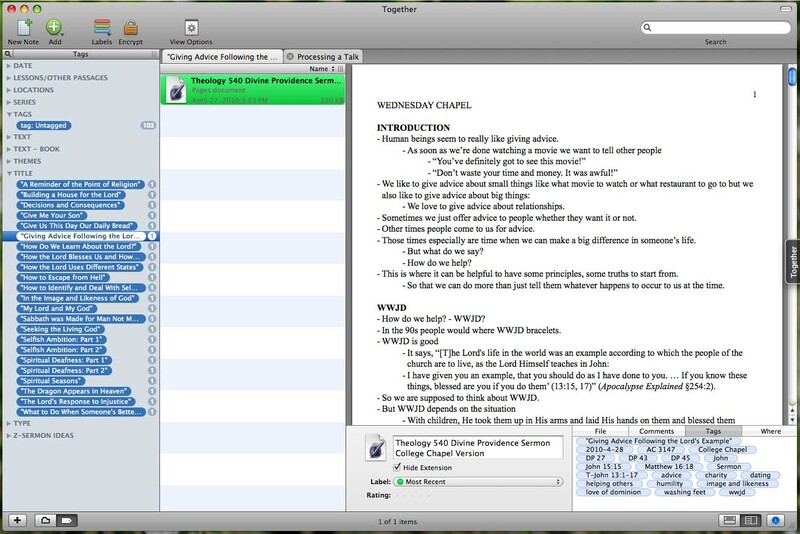 Together allows you to make notes. I've circled in red where notes are stored and I put a red star on the title of the note. A preview of the note shows up to the right but I recommend double-clicking on the title so that the note is opened so you can switch back to it again more easily. (The red arrow is pointing to the tab that shows that it's open.) And then you can see the first instruction (underlined) which is to double-click on the file to keep track of it. 2. Add Files to Library: There are several ways you can add files to Together. I usually drag and drop them into the Library (the area circled in green). I say files because I often have lots of documents associated with single sermon—research files, drafts, and the final draft. Once you've added files to the Library they show up under Recent Imports. In this case it was 10 files (I circled it in green and put an arrow to it). Note: when you add files to Together it copies the files into a Together folder in your Documents folder. And when you put the files into folders and sub-folders it does the same thing on your hard drive. So, once you've copied a file into Together, you can delete it. 3. 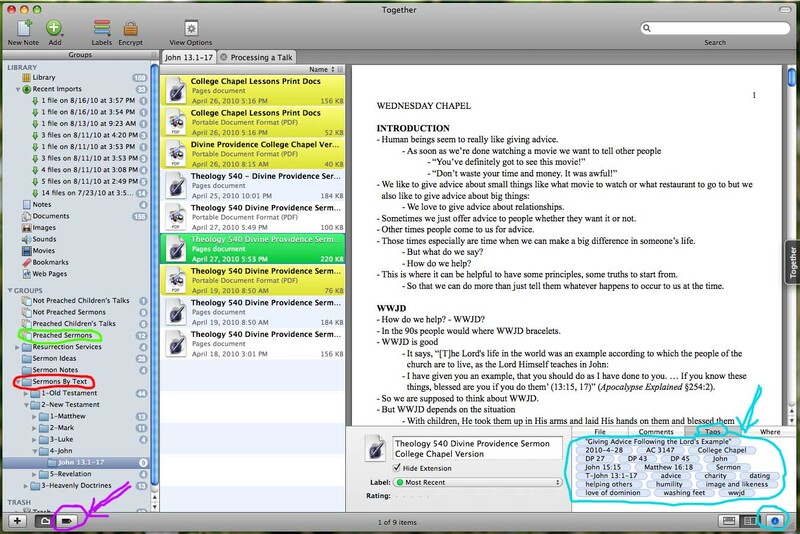 Label Files: Together allows you to label files, tag files, put files in groups, and put files in folders. Labels in Together are like radio buttons—a file can only have one label. I use them for keeping track of which file is the "Most Recent" version and which other files are "Worth Looking At" the next time that I'm looking at a given sermon (see Screenshot 2). 4. Put Files into Folders: Once I've identified the most recent version I scroll through that until I've identified what the text is for the sermon—in this case John 13:1-17. Then I make a folder with that title in the right part of my folder hierarchy (see Screenshot 3). 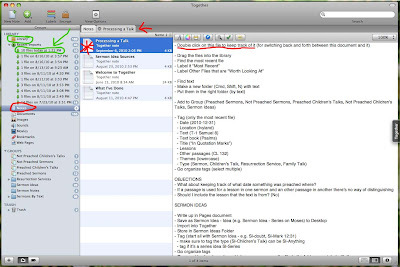 I have a top level folder called "Sermons By Text" (circled in red). Within that are "1-Old Testament," "2-New Testament" and "3-Heavenly Doctrines." Within each of those is a folder for each book. And within the right book ("4-John") I make a new folder. I put numbers at the beginning of the folder names to get them in the right order. I also have folders for "Resurrection Services," "Sermon Ideas" (I'll say more about these later), and "Sermon Notes" (for notes about sermon writing). 5. Add File to Group: Groups work like playlists in iTunes. You can add any files to them, in any order (you can also make smart groups, like smart playlists, though I haven't found any use for them yet). I have 4 groups: "Not Preached Children's Talks," "Not Preached Sermons," "Preached Children's Talks," and "Preached Sermons" (circled in green on Screenshot 3). I use these groups to keep track of those 4 things. 6. Tag Files: We've finally reached the most important step. I only tag the file labeled "Most Recent" so that numbers for each tag are accurate to the number of sermons that have that tag. Once I've selected the right file I click the "i" icon (circled in light blue on Screenshot 3) which brings up information about the file; then I select the Tags tab (circled in light blue with an arrow) and add tags. These are the types of tags I use (with an example in the format I use): Date (2010-4-28); Location (College Chapel); Text (T-John 13:1-17) [the "T-" is to distinguish it from times when I might tag another sermon with John 13:1-17 because I cite that passage but it's not the text]; Text book (John) [this is so that I can keep track of how many times I've preached from each book of the Word]; Title ("Giving Advice Following the Lord's Example"); Series [if it's part of a sermon series which this example wasn't]; Lessons/Other Passages (DP 27, Matthew 16:18); Themes (advice, humility, image and likeness, love of dominion) [I'm pretty loose with what I put under theme]; Type (Sermon) [4 options: Sermon, Children's Talk, Resurrection Service, Family Talk]. 7. Sort Tags into Tag Bundles: This function was one of the main selling points for Together for me. If you click the Show Tags button (circled with an arrow in purple/pink on Screenshot 3) you get the screen shown in Screenshot 4. And here you can move tags into tag bundles. In Screenshot 4 I've expanded Tags and Title. If you haven't used a tag before, it's in Tags and you can drag and drop them into the bundles that you make. You can select multiple tags at once using shift and command as you would expect. Getting the tags to drag and drop can be frustrating; the trick is to pull them a little to the right before you try to move them up or down. This might seem like a lot of work but, now that I've figured out how I want to use it and got it set up, adding a new sermon is actually pretty quick. And there are 2 main reasons why it's worth all the work: analyzing my sermons and finding my sermons. Using all of these tags and groups and bundles makes it easy to find out when I last preached a sermon, what I've preached in a certain location, how many times I've used a certain passage in my sermons, how many times I've preached from certain books of the Word and which ones I've never preached from, etc. Together also makes it easy to find a certain sermon. Say that someone asks me a question about merit. I know that I've written at least one sermon about that but I might not remember what the text was (and so if I just had my sermons in folders by text it would be difficult to find it). Using Together I can either search all of my sermons for the word merit (and it's easy to find the documents worth looking at first in the search results because of the labels) or I can go to the Themes tag bundle and click on the merit tag. Then I remember that I have a children's talk and a sermon on merit and because I can see all of the tags that both have, it's easy to go find the relevant folder and find all of the research documents for both talks. Sometimes the best piece of information for answering the person's question is not in the sermon itself but in the research document. 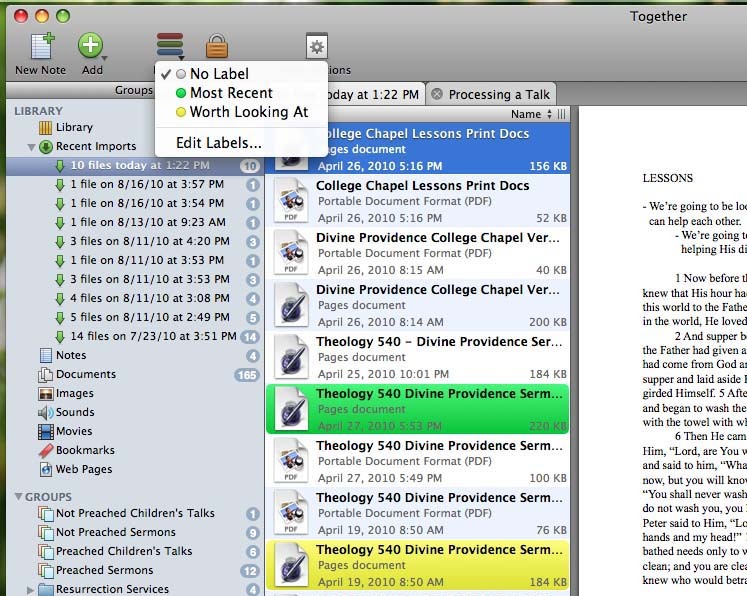 And, because Together gives me the use of folders as well as tags, I can easily group all of the documents I generated while writing a given sermon. Hooray for hierarchical and non-hierarchical storage! 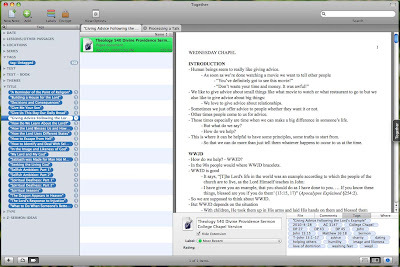 Another bonus about the way Together works is that, once I've found the file that I want, I can preview it in Together but when I double-click on it, it opens it in the original program (even awesome, atypical programs like Scrivener). Some of the other programs I played with had to open the files through their own weak editors and so could only open basic file types. Together is also good for working with sermon ideas. When I have an idea for a sermon I also put it into Together. First I write down as many thoughts as I can about the idea in a document. Then I save it to my desktop, drag and drop it into Together, and drag and drop it into the Sermon Ideas folder. Then I tag it with as many things as I can think of, all with SI at the beginning (e.g. SI-entrance into faith) to distinguish them from tags on actual sermons—possible titles, themes, text or lessons, possible main message, etc. Then I go and sort all of the tags into the sermon ideas tag bundle, "Z-Sermon Ideas" (the Z so that it will be at the bottom). And then, when I need to write a sermon, I can look through all of the different sermon idea tags and see what I want to explore further. I hope this rather nitty-gritty tour gives you a sense for why I'm so excited about this as a sermon organizing solution. Together costs $40. Is it worth it? I've been happy with it. If you think you might like it, you could try the free 15 day trial and then decide. After a quick google search I came up with Evernote as a popular alternative to Together and Caltx as a possible alternative to Scrivner. pretty good, pretty good. Apparently good old, Word Perfect used to allow you to associate multiple documents with one project and even open them all together to easily switch amongst them with tabs. Sounds like Together offers some of that function. I like the idea of all those functions. But I suppose it ties you to Mac and Together for the rest of your life? What happens if Together disappears in 20 years? Digitalia is so powerful for so many things, but I still don't know what to expect over long time horizons. Derrick, Evernote was one of the programs I played with when I was deciding what program to use. It certainly is an awesome and powerful tool. One thing it does is store everything you put into it online as well. This has advantages and disadvantages. The main disadvantage being that once you get past a certain amount of space you have to start paying for a premium account ($45 a year). It's got a very good search feature (that even can recognize hand written text) but it doesn't allow you to organize things yourself very much (with folders or tag bundles). But don't let me dissuade you from trying it. Let me know if you do and it works for you. Brian, you raise good questions. I'm happy with being tied into Mac. If I went with Windows, I'd been tied into Windows eventually. I'll just have to wait and see what happens with Together. One nice thing is that you can get it to sort of embed the tags in the actual files. Files on Macs have a comments area and Together can export tags to that area so, even if Together eventually goes caput, I'll still have the tag information associated with the files. Who is the Word for?